American Singer – Songwriter Lindy LaFontaine draws inspiration for her music from her personal experiences such as relationships and the many parts of the world in which she has lived. As the daughter and the only child of parents she describes as being hippies and who have spent their lives involved in humanitarian work on behalf of women and children in numerous countries, Lindy LaFontaine and her music are like a kaleidoscope. Those colors and reflections are beautifully displayed in the songs that will appear on Ms. LaFontaine’s new album, This Too, In Time, Shall Pass that will be released September 21st. The Pop / Trip Hop / Alternative artist collaborated with producer Stewart Myers (Rachael Yamagata, Jason Mraz, Rhett Miller), keyboardist Patrick Warren (Stevie Nicks, Macy Gray, Beth Hart, Fiona Apple, Melissa Etheridge), guitarist Mark Goldenberg (Al Stewart, George Jones, Linda Rondstadt, Chicago, Peter Cetera, Melissa Etheridge) and drummer Brian Jones, to weave beautiful musical tapestries such as “Free To Breathe,” a song that showcases Lindy LaFontaine’s incredible vocal gifts. “Everybody is going to translate “Free To Breathe,” differently. It was definitely about a relationship. I think most of my songs have a little bit about relationships in them. It is about relying on other people and how in the end we are really all alone. I definitely talk about that with all of the songs. That was about a relationship that I was in that really made me feel smothered, but I put myself in that situation. You do that sometimes. It is like, why am I doing this to myself? It is when you can’t even define yourself without them. You give up a big part of yourself to be with them, but it is the same part that is scary. It is the independent part of yourself and you just know it is going to blow-up someday. I felt that I was on to that pretty early in the game and that is pretty well what that song is about. Now I am “Free To Breathe,” and I am talking about the relationship (she had). In fact, there are a few of the songs that are about my relationship, which was my first love,” she says. Lindy LaFontaine’s parents would move just about every year or two while she was growing up and contrary to what one might surmise, Ms. LaFontaine says that she did not find that nomadic lifestyle difficult, as that was all that she knew. In fact that pattern has continued into her adult life, as she has moved numerous times. “It wasn’t difficult for me at all and in fact I lived a lot in my head. I really did. I remember things that I used to think about all of the time. I remember contemplating about anything from a phrase to philosophy, religion and all sorts of weird things. I was really, really young and I just had so much time to think about this stuff,” says Ms. LaFontaine. “A lot of things stem from childhood periods and that was my childhood. I didn’t have siblings to bounce things off of, so I very much lived in my head. I do think about that (how it influences her creative instincts) a lot to answer your question. I end up questioning myself a lot (today), my songwriting, my life and absolutely everything, because my upbringing was so abnormal. Often times I will find that people do things very differently than I will do them. There are certain things that everybody knows that I don’t know, including songwriting. There are formulas that I don’t agree with necessarily. It is not that I don’t contemplate them or that I don’t like them. I do go out there and seek this knowledge. I know a lot of people who want to do songwriting and who say that they are very against learning songwriting. Any kind of knowledge is going to just make it less you, less real (is what they say) and I don’t buy that. I think the more that you know the better, yet at the same time, the stuff that I do know, the stuff that is mainstream and that quote unquote works, I don’t agree with. I think that also stems from moving around all of the time and just not thinking the way that other people think,” she says. Although, neither of her parents are musicians, singers or songwriters, Lindy LaFontaine’s father’s musical taste buds did provide inspiration for her early in life. “My father loves music and he listened to a lot of Doo Wop when I was growing up. I can’t talk to most people about it these days, because they don’t know what Doo Wop is. The harmonies are so cool and the vocals are amazing. I remember sitting there and picking out the different harmonies when I was three and four years old. I remember the song that I first listened to like a musician. I don’t know how to explain it. I sat there and I listened to the musicality of it (versus) just listening to it. When I was two and one half, I had one of those Fisher Price tape recorders with a microphone. I was listening to the song “The Three Little Fishies,” and it is an old Jazz song. The harmonies are really cool and I remember listening to it and getting into it. I was feeling it with my eyes closed (she laughs). I remember that moment and thinking, this is awesome. It just sort of took off from there. I had these cassettes that I recorded myself singing on. It was a dual cassette. I would flip it over and I would record another harmony over myself. I would keep doing that and eventually on a cassette you can’t make anything out. It just gets that distorted. I was in Bangladesh at the time,” she recalls. Lindy LaFontaine’s song “I Do,” should have concertgoers getting up out of their seats. This is a spectacular performance by a songwriter who truly knows how to communicate her thoughts and feelings through her lyrics and then impeccably phrase them, as her vocals evoke a strong emotional response from the listener. The arrangement and the musicianship are stunning. Like another Pop – Alternative singer-songwriter, Paula Cole, Lindy LaFontaine possesses the same ability to engage the listener and then draw them into her music, until with her lyrics branded upon their hearts they echo her words back to her. 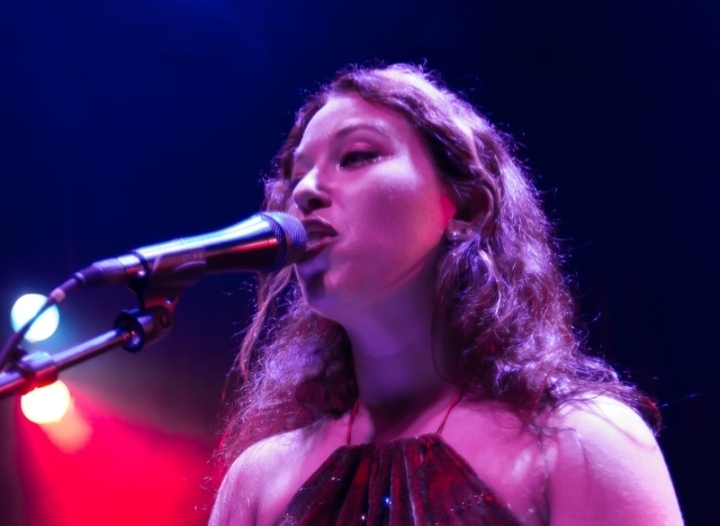 When she graduated from her high school, the School of the Arts in San Francisco, Lindy LaFontaine was accepted at Berklee School of Music, Juilliard and the Tisch School of Arts at NYU, however, she decided to refine her music skills in England, when her application to the Liverpool Institute of the Performing Arts was accepted. It was while at a job fair that Lindy LaFontaine first became aware of the Liverpool Institute of the Performing Arts. “It was only two years old and they had a big picture of Paul McCartney on their little booth. My mom pulled me over to the booth and she said, ‘Look at that one. I love Paul McCartney.’ I didn’t know The Beatles that much. I liked the Sgt. Pepper’s Lonely Hearts Club Band album. I know a lot about The Beatles now. I applied there (Liverpool) and they were the last ones to accept me. They took forever and they made me audition to audition. They also asked for press clippings (she laughs). You have to be famous to go there. That is why I was one of the youngest people there. The average age was about thirty. There were a lot of people there in their forties and fifties. There was one guy there in his seventies and he was cool. I think that I might have been the first American and if not the first, the second. It is three years to get your Bachelor (degree). I was in Liverpool for three years and then I moved down to Derbyshire (for one year),” she says. Ms. LaFontaine’s cover of the song “Low,” by Cracker, which she recorded while living in Liverpool resurfaced earlier this year when it was selected as the Best Cover Song at the 10th Independent Music Awards. The panel of judges included; Seal, McCoy Tyner, Counting Crows, Aerosmith, Suzanne Vega, Tom Waits, Aimee Mann and Jonatha Brooke to name just a few of the notable artists who gave her recording the thumbs up. You can listen to the music of Lindy LaFontaine, including some songs from her new album This Too, In Time, Shall Pass, at her reverbnation website.